»Delhi To Pushkar – A Ride Bursting With Hues! Delhi To Pushkar – A Ride Bursting With Hues! The tranquil city of Pushkar is surrounded by hillocks on three sides. On a normal day, one will hear all the humming and drumming as this petite town is home to almost 400 temples; Brahma Temple being the most revered and visited one. Popularly known as Rose Garden of Rajasthan, Pushkar is a world-famous exporter of roses. The divine essence of Pushkar roses will linger in your sensory organs for days together! A trip to Pushkar is considered as an ultimate pilgrimage. It is trusted that after completing the Chaar Dhaam Yatra, Pushkar has to be visited to attain salvation. If not, the yatra is deemed to be incomplete. On arrival into this colourful city, you will be mostly greeted by foreign tourists, who have now permanently settled in Pushkar. 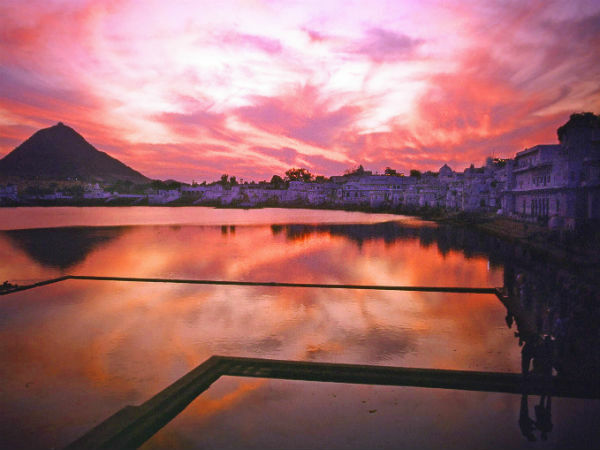 A glimpse of heritage, culture and history is all that Pushkar will offer! Tourists prefer visiting this holy city during the months between November and March. Winters make it pleasant for the tourist to explore the destination. Desert safari during this season is a must-do activity. Most of the fairs and other festivities hold their charm during the cold weather. Summers are quite hot and monsoons don't get much rain. Very few tourists visit during this period. How To Get To Pushkar? Route 1 is recommended. Pushkar takes 7 hours from Delhi via this route. Route 2 takes about 9 hours. Start early from Delhi. Drive about 130 km to reach Neemrana. Located in Alwar district of Rajasthan, Neemrana is the home town of Maharaja Prithvi Raj Chauhan. Not only does it provide a base for history buffs but it also is a budding industrial zone. Japanese Industrial Zone and Korean Industrial Zone are in the pipeline of putting their roots in this area. You can consider staying at the fort . If it doesn't fit in your budget, at least visit the palace. Sariska National Park, Bala Quila and Old Baori. All of these reflect the beauty of old architecture. Adventure maniacs can opt for zip lining-a facility that Neemrana Fort offers! Drive further 155 km to reach the Pink City. Don't miss the famous dal baati churma that is staple to this state. And what better place than Jaipur to gorge on this delicacy. Chokhi Dhani is one such place where you can have a glimpse of Rajasthani culture-from food to attire to lifestyle! For obvious reasons, the capital city has a lot of scope to explore. It is a best place to shop for the brides-to-be. Hawa Mahal, Amer Fort and Jal Mahal will enchant you with their architecture and history. Street food in Jaipur should not be missed. Head towards Rawat Misthan Bhandar to hog on lip-smacking pyaaz ki kachori. Keep your diet chart at bay while you are touring Rajasthan. Eat without guilt! You can also try a filling lassi. Crossing the city of Jaipur and driving 146 km further via NH 48 will land you in the fascinating city of Pushkar. By Rail: There is no railway station in Pushkar. However, Ajmer is the nearest railway station. For more information, refer here. By Bus: Two buses run daily between Delhi and Pushkar. It takes approximately 9 hours to cover the distance. Gather further information here. By Air: As of today, Jaipur International Airport is the nearest airbase to Pushkar. There is soon going to be an airport in Kishangarh. The distance to be covered then, to reach Pushkar, would be approximately 45 km. Home to Pushkar Fair, Pushkar Lake is sacred to many Hindus. It is undoubtedly one of the major attractions in Rajasthan. Going back in history, it is believed that Lord Brahma was looking for a place to perform a religious ceremony. He dropped a lotus on the site and it is now Pushkar Lake. It will be interesting to know that the only temple of Lord Brahma in India is in Pushkar-one of the major reasons why Pushkar has a high footfall. Before you step into this magnificent temple, take a dip into the holy Pushkar Lake to cleanse your mind, body and soul. Ever got angry and climbed to a hilltop? That's what Goddess Savitri did. She is the first wife of Lord Brahma. Situated on top of Ratnagiri Hill, Goddess Savitri had built this temple in anger to keep an eye on Lord Brahma, who had got married to another woman. You need to trek for almost an hour to reach the temple. This famous fair attracts tourists from all around the world. The villagers take part in cultural events and competitions. The colours and vibrancy during this festival is a sight to see. Men trade their livestock, horses and other cattle over the banks of Pushkar Lake. There are many other activities in the fair that keep the villagers occupied. Resting on the banks of Sarovar Lake; this Mughal influenced Royal Palace is worth a visit. It was originally built for Raja Man Singh I, who visited this place as a retreat centre.